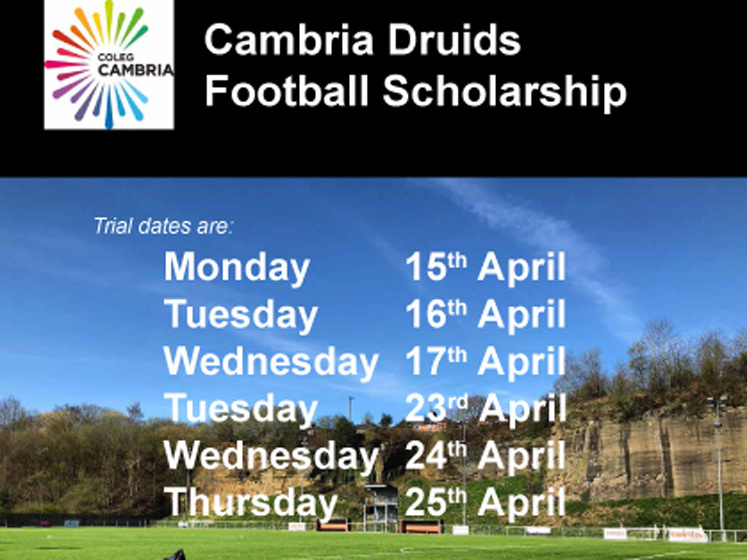 Coleg Cambria, and Cefn Druids AFC., are running a football scholarship programme commencing in September. Learners will be able to study any course at either the Yale or Bersham Road site, with some scholarship programmes just offering Sport courses. The football timetable will be built around the College day, with gym sessions on some mornings before College and training some evenings at the Club 4-6. The scholars will represent “Cambria Druids” on a Wednesday afternoon in the AoC North West League, and represent Cefn Druids at the weekend. There will be equal focus on education and football. It is a fantastic opportunity for any young and talented footballer, who aims to make it to the Welsh Premier, or higher in the senior game, as well as ensuring a first class education in their chosen field. Trials dates are below. It is suggested that players attend at least 2 of these sessions. For more information, contact Sally Jones. Email: sally.jones1@cambria.ac.uk.